Wouldn’t it be wonderful if you knew about the future direction of stocks? Well, the good news is -this is not really a pipe dream. Just as the best indication of future behaviors is the past behavior, the pricing of a stock can also be predicted to an extent from its past activity, using something called as technical analysis. However, the bad news is that when you attempt to learn about stocks and their price movements, most of the trading courses do not provide a good insight on how to master technical analysis. So, what exactly is technical analysis? Technical analysis is a trading tool used for the evaluation of securities in order to predict the future price of the security. The future price is predicted based on the statistics like price movement, open interest figures, and volume obtained from trading activity. However, it is not based on intrinsic value of the security. The underlying concept of technical analysis is gleaned from two assumptions of Dows theory. The first assumption is that every factor that can potentially influence a security’s price is already discounted by the market. The second assumption is that the price movements of the market are not random but consists of identifiable trends and patterns that repeat over time. Technical analysis can be used for predicting the price movements of any tradable instruments like stocks, futures, currency pairs, and bonds. The only requirement is that they need to be subject to the forces of demand and supply. 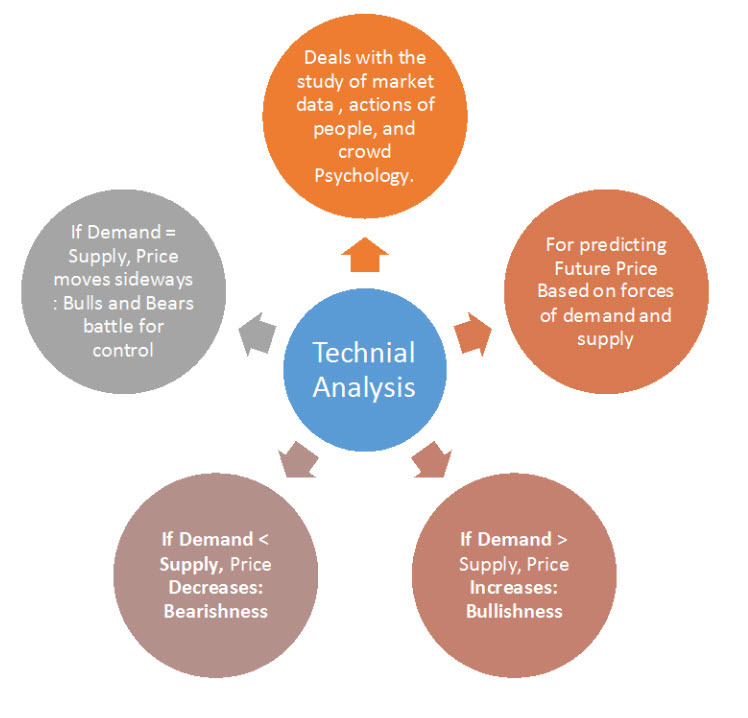 In short, technical analysis basically deals with the study of market data , actions of people, and crowd Psychology. Technical analysis can also be termed as the study of demand and supply forces as reflected in the market price movements of a security. Prices of a stock are driven by supply as well as demand. Whenever there is excessive supply, it is a sign of bearishness and selling. Similarly, whenever there is excessive demand, buying happens and is an indication of bullishness. Whenever the demand, as well as supply, seems to be at an impasse because of equal demand as well as supply, the price starts to move sideways and the bulls and bears wrestle for control. Well then, how do you use technical analysis? Technical analysis helps in predicting the upcoming price movement of a Stock/ commodity/ currency pair etc. Using this, you will be able to make a decision whether to buy, sell, or hold the security’s position. Over the years, analysts have developed quite a few technical indicators for predicting future price movements. These indicators can be applied to the charts using various time frames and can be used to identify a trend, the strength of the current trend, possibility of continuation of the existing trend etc. Some of the important Technical Indicators and Overlays are trendlines, moving average convergence divergence (MACD) indicator, RSI, Stochastic, Bollinger Bands etc. The above figure shows the technical indicators RSI and MACD for the stock Apple Inc.
Now that you have a basic understanding of technical analysis, you can now confidently learn about stocks and apply various technical indicators on them to predict their prices. Attending workshops, seminars, and trading courses also help in sharpening your technical analysis skills.